After a year in which home sales across BC rose more than 21 per cent compared with 2014, according to Canadian Real Estate Association (CREA) projections issued mid-December, the province’s housing market activity is forecast by the association to moderate in 2016. 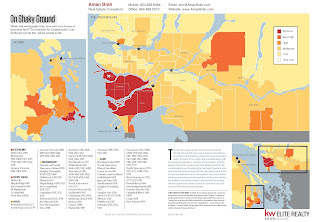 This is largely based on the British Columbia Real EstateAssociation (BCREA) predictions that sales across the province will fall by around seven per cent, from more than 100,000 in 2015 to 93,700 units in 2016 – a level described as “remaining elevated” by the BCREA.This could be caused by a cooling-off in demand but more likely by a lack of available homes for sale, with Greater Vancouver and Fraser Valley listings down 35 per cent year over year. Despite the predicted slowing in sales, prices in Greater Vancouver and across BC are expected to increase further in 2016 – albeit at a reduced pace than last year. CREA expects the annual price increase across BC for all of 2016 to be just two per cent, compared with 11.5 per cent in 2015. A forecast by RE/MAX issued in December was more bullish, expecting average prices to rise seven per cent in Greater Vancouver, three per cent in the Fraser Valley, 2.7 per cent in Victoria and two per cent in some slower areas, including Kelowna. The BCREA also predicted that capacity constraints and what it describes as “easing-off consumer demand” will mean a decline of BC housing starts to 28,800 units in 2016. This is slightly at odds with CMHC predictions for Vancouver alone, which forecast a modest increase in housing starts in 2016, followed by a slowdown in 2017. However forecasts were similarly timid and, ultimately, far off the eventual outcome for 2015 – and there’s no discernible sign of this activity slowing significantly. The possibility of rising interest rates and the new increased minimum down payment to be implemented in February may have a minor impact on some segments of the market. But continued high demand and diminishing supply of single-family homes suggests that, while overall unit sales growth may slow, total transaction dollar volumes will likely continue to soar through 2016. There’s no sign that demand for Lower Mainland real estate from overseas buyers will cool in 2016, and as large detached houses in desirable neighbourhoods get snapped up as homes or investments, foreign money will likely further spill over into commercial and recreational real estate. Evidence suggests that overseas buyers have increasingly looked to resorts, vineyards, commercial properties, multi-family buildings and the like as alternative methods of safeguarding their cash in 2015. However, this increasing trend is unlikely to redirect any money away from single-family homes in Greater Vancouver, which remain the number one choice of property as many families choose to relocate to the region. At the other end of the market, the much-anticipated arrival of 1,500 Syrian refugees, mostly in family units, to Vancouver may put some pressure on the rental market – and will certainly put pressure on the city to provide affordable housing options for these families. The Year of the Condo? With demand for the increasingly rare single-family home continuing to push many buyers out of that market segment, it is likely that more and more buyers – from first-timers to families – will turn to condominium living in 2016. As of January 2016, New Westminster is the first municipality to demand a minimum of 30 per cent of new condos to have two or more bedrooms, and a minimum of 10 per cent to be three or more bedrooms. This is a move that has troubled developers but the city hopes will ultimately provide more affordable options for family living. The new minimum down payment rules being implemented in mid-February could result in an uncharacteristic January rush on smaller homes, as first-time and lower-income buyers attempt to find and buy their homes ahead of the new rules to save money. On my recent visit to Northeast BC I was exposed to cities that are preparing for something bigger. Obviously going from Metro Vancouver or if you're coming from Calgary or Edmonton both cities don't measure up but what you do notice, is a lot construction, Highway improvements and you sense that most people are doing well financially. You see somewhat big name brands starting to establish a presence in the area, from new Hotels such as Best Western Plus being constructed and scheduled to be ready for November 2016, to Restaurants like Brown's Socialhouse, Original Joe's and Bosa Properties renovating the Dawson Creek Mall and so the list goes on. The announcements made over the last few months continue to grow and prove that it’s a matter of WHEN and not IF. The year 2016 will be an important time for the BC LNG industry as it's no surprise the current state of the oil and gas industry is weak, so I wanted to share some facts surrounding these projects. If you’re looking to make your festive season truly merry and bright, look no further than these locations where Christmas lights are the main attraction in the Tri-Cities. In Coquitlam, Port Coquitlam & Port Moody you get a natural setting with many trees and green spaces, lighting up for the holidays is must-do. Stop by for a spectacular photo-op and even some pretty amazing light shows. Coquitlam Lafarge Lake: 1299 Pinetree Way, Coquitlam, BC V3B 4S1 - With more than 60,000 lights and a number of unique illuminated features, ​this is one of the largest free seasonal displays in the Lower Mainland.